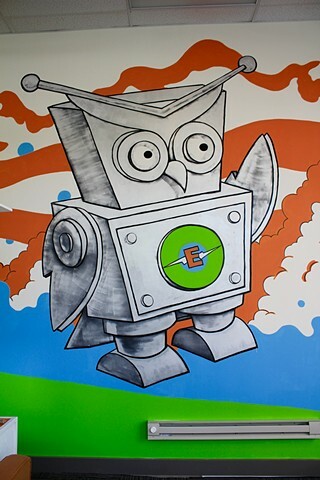 Commissioned mural for CodeVa - a non-profit built to promote computer science and computer programming all across Virginia. The robot ("Eureka" I think) - is a logo of sorts designed not by me. The colors were limited to the logo colors (orange, green and blue) continuing the length of the building. The green gradually increases in height and doubles as a green screen for some of the camp projects.